Second World War servicemen who lost their sight in the conflict started playing cricket as recreation, but today the visually impaired game is a serious competitive sport. Seven county teams compete in a national league and a further 12 counties have teams. Meanwhile, the England VI team contests one-day internationals, Twenty20 Internationals as well as battling an Australian VI in The Ashes. 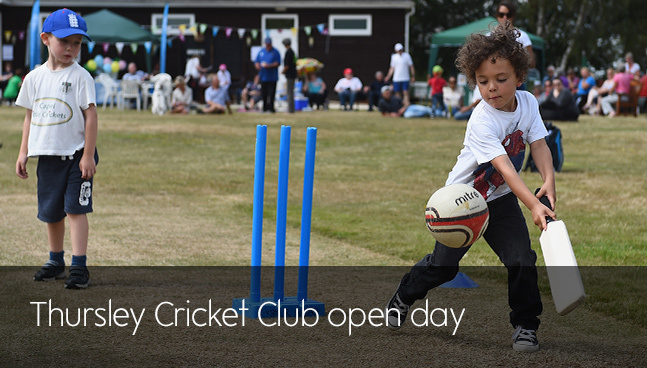 To open up the game to more youngsters, the English Cricket Board held an open day earlier this month. Hosted by Surrey’s Thursley Cricket Club and supported by Waitrose, the event featured a match between the Surrey VI team and able-bodied players from L’Anson cricket league who wore sightlimiting glasses for the game. On the day, taster sessions took place alongside the match for visitors. Will Todd, 44, and wife Beth Halliday, 40, took their children along. Daughter Rowan, eight, has lost some sight after a brain tumour for which she is undergoing chemotherapy. Taking the field in the match was 16-year-old Josh Nonet-Black who is blind. A regular in the Surrey VI team, he has recently been invited to train with the England squad. ‘I would definitely tell other visually impaired people to go for it,’ he said. A size three football containing ball bearings is used. The stumps are larger. The bowler must ask the batsman if he is ready before a run up and shout ‘play’ as he releases the ball. A totally blind fielder can catch the ball after it has bounced once.